Education Minister and Jewish Agency chairman participate in evening of dialogue in Shoham. 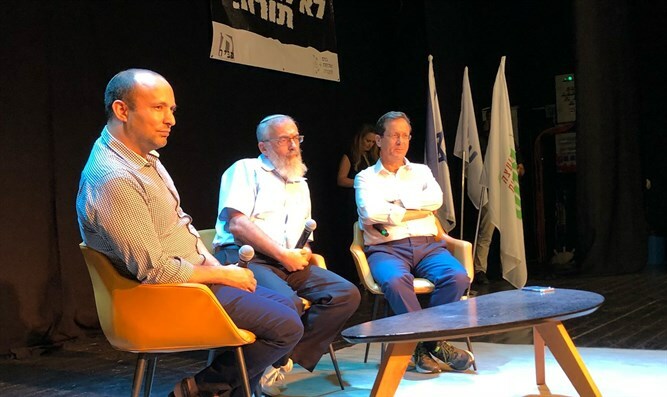 Education and Diaspora Affairs Minister Naftali Bennett and Jewish Agency chairman Yitzhak Herzog took part on Saturday evening in a night of dialogue in Shoham on the occasion of the fast on Tisha B’Av. The evening was held as part of the “Tonight We Do Not Study Torah" events which are held on the eve of Tisha B’Av throughout Israel and which are organized by the Sderot Conference for Society and the Sapir Academic College. Speaking of the death of IDF soldier Aviv Levi, who was murdered by terrorist snipers along the Gaza border on Friday, Bennett said, "The entire nation united this evening in mourning over the death of St.-Sgt. Aviv Levy of Petah Tikva. Anyone who read the Book of Lamentations this evening was made aware of the price our people paid when we did not have a state. Aviv's death reminds us of the price we pay in order to have a state." "When I was a child, it was said that the state was destroyed by baseless hatred, and I thought that these were folktales. As I get older I understand – it is only because of baseless hatred that we lost the Jewish state we had. Whatever happens, we must remember that we will not have another chance to live here together. We have to fight at all costs and in every situation for the unity of the people. Even the most difficult things - we will not allow them to tear the people apart," continued Bennett. Bennett added, "In recent years, I have undergone a change of mind and I understand now that it is good to have another opinion. I said at the Israel Prize ceremony: 'If I could push a button and the differing opinions would disappear, I would not push that button', and I mean it. The fact that there are different opinions causes me to ask questions, to investigate, to check, to understand that I do not have the entire truth in my pocket. " Speaking of the Jews in the Diaspora, Bennett said, "The only thing that keeps me awake at night is the future of the Jews of the Diaspora. If we do not act urgently, in the next 50 years we will lose 2-3 million Jews around the world. There are two words that are the compass of my life: Netzach Yisrael (lit. the eternity of Israel). In the State of Israel, and in the Diaspora." When Bennett was asked about the allegations of religionization in the education system, he replied, "I oppose religious coercion. I think that the Tanakh and tradition are not the exclusive property of the religious, but that they belong to the entire Jewish people. We have to be educated - they call it religionization but it's the exact opposite. I have no goal of there being religionization here and we all need to understand that we need to connect to our heritage. I think that robbing people of the stories about Shaul's battles with David and other stories would be a terrible thing." Herzog also weighed in on the issue and said, "Since I know the Education Ministry and its Director-General, who was in the past my CEO and a member of the Labor movement, I know that the system does not operate using religionization, but that all sorts of organizations enter the picture and did so long before Naftali became Education Minister. Some of them enter without pedagogical supervision and engage in a way that is not suitable for modern discourse." Bennett concluded his comments with the issue of the Temple Mount and said, "The Temple Mount in my mind is first and foremost the center of the Jewish people. I think that it is very wrong that the situation on the Temple Mount is that the authority operating there is an Arab government that creates a situation in which a Jew feels like he’s second class while on the Temple Mount. The Temple Mount is under Israeli sovereignty but is controlled by Arabs. At the end of the day, a symbol of sovereignty is whether you walk around there and whether are you allowed to pray there, and that is not the case. That is wrong. In order to correct this, you need common sense."